Fruit Infuser Water Bottle Just $6.99! You are here: Home / Great Deals / Amazon Deals / Fruit Infuser Water Bottle Just $6.99! Head over to Amazon and get the Fruit Infuser Water Bottle for just $6.99 in blue (reg. $39.99). Shipping will be FREE with Amazon Prime or an order of $35 or more. You can also get this in black for $7.89 or red for $7.99. EASY TO USE: Water + Fruit/Flavor of your choice + *SHAKE* = Your Infused Masterpiece! Add strawberries, mangos, kiwis, limes, lemons and many more to the infuser capsule, fill up the bottle with water, and make sure to shake thoroughly! You can pop it in the fridge for 15 mins or longer for extra flavor. EASY TO CARRY: Our unique loop handle makes carrying your bottle a breeze. Enjoy your favorite flavored water on the go, in the gym, at the office or bring it along on a hike. Stay hydrated with delicious healthy water every where you go. LEAK PROOF: Kaynec’s uniquely designed lock lid guarantees a 100% leak proof experience. Not a single drop will spill whether it’s upside down, sideways or in a bag. GREAT FOR YOU AND THE ENVIRONMENT: No more unhealthy sugary drinks filled with chemicals. Make your own healthy water not only means a healthier you but also a healthier earth. 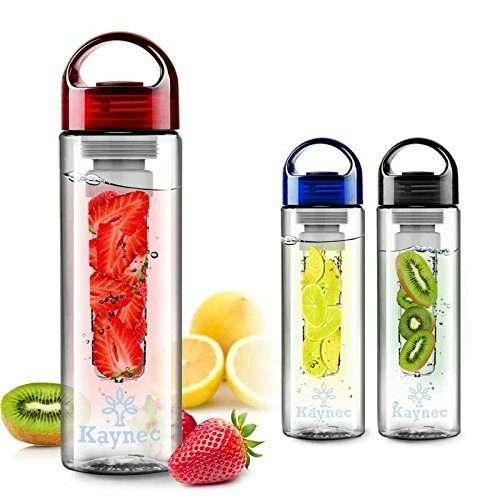 By using Kaynec’s fruit infuser bottle, you reduce your carbon footprint with less consumption of soda bottles and disposable water bottles. SAVE MONEY: Our bottles are made from BPA free premium Tritan plastic. It can be reused over and over again. You save money by eliminating the need to buy expensive unhealthy sodas and overpriced water at the store.